The Benefits of Ozone in Aquariums – Ozotech, Inc. Some of the most fascinating aspects of owning and maintaining an aquarium involve the vivid colors and intriguing shapes of the coral, fish and other living organisms that you select. Whether filled with Boseman’s Rainbowfish, German Blue Rams or Flowerhorn Cichlids, you’re going to want to protect the inhabitants of the indoor fish tank that decorates your living space or entertains guests at the restaurant, bar or hotel that you own. You may already know that there are several factors that come into play when sustaining a healthy environment for aquatic plants and other marine life. However, when dealing with your viewing experience and the efficiency of an aquarium system, there is no denying the significant role that water quality plays in the scheme of things. And in case you didn’t know, this is an area of upkeep that can greatly benefit from the use of ozone. How Does Ozone Work in an Aquarium? The best way to describe the process of using ozone in an aquarium is to first understand its chemical makeup. You’re probably already quite familiar with oxygen (O2), and far less acquainted with the three-molecule makeup of ozone (O3). Ozone is often described as highly reactive because out of those three molecules – one desperately wants to separate itself from the trio. When this particular revolt takes place, ozone produces an impressive, oxidizing effect. Fortunately for us, we have learned how to harness the power of ozone to achieve numerous goals, including improving indoor fish and reef tank maintenance. In order to safely use ozone in an aquarium, you’re going to need a machine (an ozone generator) that is able to continuously produce ozone for your tank without interruption. For example, our Poseidon Series generator uses Ozotech’s superior technology to create an electrical charge that splits the oxygen molecules of O3 for effective delivery of all-natural and safe ozone anti-microbial disinfection. Upon entering a protein skimmer chamber or ozone reactor, the ozone gas is then integrated into your existing aquarium water. Lastly, the outflow from the chamber undergoes a filtration process that removes residual ozone before the water returns to your tank. 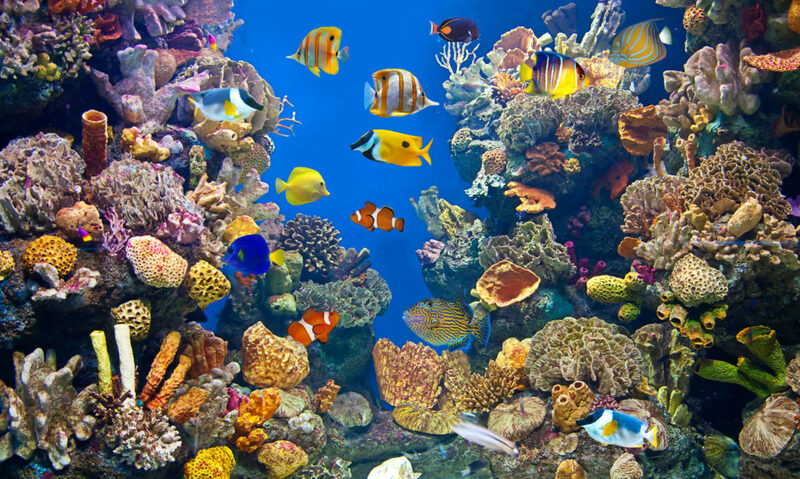 Hundreds, if not thousands of dollars are spent to outfit aquariums with eye-catching hues meant to bring your very own slice of the Great Barrier Reef to life within the comforts of your home or business. Therefore, it’s no wonder that one of the biggest complaints of an aquaria enthusiast, reefer, or the average onlooker is when a tank has a cloudy or discolored appearance. An unavoidable element that occurs in untreated aquarium tank water is yellowing (however slight it may be) which is caused by fish food residue, aquatic waste, and algae. While nature has a self-cleansing mechanism, a confined tank does not, meaning that your aquarium needs a little help to operate at its highest possible level of enjoyment. Ozone has the ability to counteract the unwanted effects of organic material in a tank that cause clouding or coloring water. For instance, ozone efficiently oxidizes the yellow pigments in reef aquariums, which are often responsible for a tank appearing ‘dirty,’ exhibiting reduced light penetration, and diminishing the usual attractiveness of coral. When properly administered, ozone greatly enhances the look of a tank, as well as eliminates the need for cumbersome water changes because ozone transforms yellowed salt water back to having the same clarity levels as freshly mixed salt water. With ozone, you are able to attain the crystal-clear, pristine blue water that you crave. The inhabitants in an aquarium can produce a toxic environment that threatens the health of the entire bionetwork. Not only do some marine creatures intentionally emit toxins meant to be harmful to other organisms, but it’s also in the nature of coral to protect itself from would-be predators, as well as uphold its ‘turf’ against other organisms. In an ocean setting, these toxins quickly dissolve, but in an aquarium, they can build up and begin to disrupt the ecosystem. Ozone zeroes in on these types of organic toxins and breaks them down into far less harmful compounds. For example, ozone has been linked to the detoxification of botulinum toxin in freshwater environments at concentrations of 0.01 ppm ozone, and produces results within a contact time of less than sixty seconds . 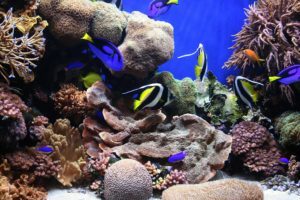 While every tank differs, it is not uncommon for the combination of fish, plants and other living organisms to create offensive odors that just really take away from the overall enjoyment that an aquarium brings. Your choice to enhance a reef aquarium with the latest technology, such as an ozone generator, will solve the issue of sea-based odors that can plague a room with seafood-like scents or the smell of decomposing material, like algae. While some aquarium owners use carbon as a remedy, choosing an ozone generator instead provides an option that consistently keeps a tank in pristine condition without the hassle of having to replace and refill carbon supplies. Ozone eliminates tank odors by eradicating the culprits behind unpleasant smells, like bacteria, spores and other molecules. That’s because ozone’s high level of reactivity is eager to chemically respond to the particles it comes across. Once the extra oxygen atom of O3 escapes and attaches itself to the molecules associated with bad odors, it alters their chemical structure into something that no longer offends our noses. One of the reasons you go to all the trouble of outfitting an aquarium with just the right kind of lighting is to not only provide an essential resource for living organisms in your tank, but to also see vibrant colors at their very best. Inconsistent lighting may cause stress in fish (which can additionally result in health problems), as well as affect the brilliance in hue of coral. Since ozone breaks up and reverses the effect of compounds that cause a yellow tinge to emerge behind your aquarium glass, water clarity improves, thus allowing you to get the best value out of your lighting through increased effectiveness. In a nutshell, using ozone allows you to truly appreciate the different shades and color intensity within an aquarium. Additionally, when you have a lighting system working at its optimum level of performance, you also help maintain and enhance the health of corals, which depend on light to survive. Corals tend not to respond well to fluctuations in light intensity. Reduction in light has been cited as a contributing factor to coral mortality, and increased ‘browning out’ over time, where coral kick into survival mode and start to lose their intriguing colors. When used properly, ozone helps maintain the light intensity that ultimately benefits coral, as well as other types of marine life. As much as we try to recreate a balanced, close-to-natural environment for our fish and other aquatic elements, it’s not uncommon for an aquarium to become overstocked with more live rocks and finned inhabitants than a tank can handle. Consequently, water becomes overridden with an elevated concentration of bacteria. In their natural environment, marine organisms are found in less dense concentrations than your typical aquarium; and therefore, do not face the same environmental challenges that generally occur within a limited space. * Increased dissolved oxygen content. Many organisms in an aquarium (like fish, plants and bacteria) need dissolved oxygen in order to thrive. It is their way of “breathing” underwater. While bottom feeders and crabs operate on minimal amounts of oxygen (1-6 mg/L), creatures such as shallow water fish require much higher levels (4-15 mg/L) . Although not a grave concern for owners of saltwater aquariums (which get a helping hand from protein skimmers), freshwater aquariums accommodating numerous active fish and large marine creatures, from koi to stingrays, especially benefit when their environment contains high dissolved oxygen levels. For example, an aquarium with an excessive amount of dying algae and other organisms causes the water to exhibit lower levels of dissolved oxygen. Pathogens and bacterial explosions (known as milky water, which causes a tank to become cloudy) also become concerns. Aquarium owners report that using a small amount of ozone provides sterilizing qualities that can lower bacteria levels in a tank. As a result, some are able to eliminate the need to use unwanted additional chemicals in their aquarium, such as chlorine, which also saves time and money. * Fight disease in fish. The natural purifying qualities of ozone makes it an excellent option for sterilizing a tank plagued by bacteria and viruses which can affect the health of an aquarium’s inhabitants. With proper monitoring, a higher amount of ozone can be administered (one that reaches 35 to 40 mV of difference) in order to cure various fish diseases . According to Tropical Fish Hobbyist Magazine, dissolved ozone and its oxidized products can have a direct effect on the gills, epidermis and other parts of a fish; and has been associated with ceasing specific diseases and infections, such as columnaris, which causes the fins of fish to rot. * Prevent disease in fish. 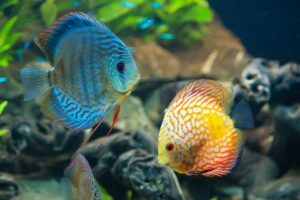 The discus genus of cichlids display captivating, patterned markings and lively shades of red, orange and bright blue, but also require a potentially elevated level of care. When in the wild, discus live in nearly bacteria-free waters. Therefore, when the creatures dwell in an aquarium with a large quantity of troublesome microorganisms, the fish face a higher risk of becoming diseased – making them just one example of an aquatic species you might come across that would specifically benefit from the sterilizing effects of an ozone-equipped aquarium. In conclusion, if you’re looking to enhance the quality of your aquarium tank water with a system that improves visibility; boosts your overall viewing capabilities; preserves and brightens vibrant colors; and helps develop a healthier environment for aquatic inhabitants – we at Ozotech are excited to introduce you to our ozone generators that have proven to maximize your aquarium experience. Ozone inactivation of botulinum type E toxin. Graikoski, John T.; Blogoslawski, Walter J.; Choromanski, Joseph. Northeast Fish. Cent., Natl. Mar. Fish. Serv., Milford, CT, USA. Ozone: Science & Engineering (1984), 6(4), 229-34 via Reefkeeping Magazine. Web. 17 January 2017. Fondriest Environmental, Inc. “Dissolved Oxygen.” Fundamentals of Environmental Measurements. 19 Nov. 2013. Ozone vs. Ultraviolet: Comparing Two Common Sterilization Techniques. Zupo, Valerio. Tropical Fish Hobbyist Magazine. Nov. 2012. Web. 17 January 2017. Resource: BulkReefSupplyCom. “Week 28: Ozone and Reef Tanks.” Online video clip. YouTube, 21 December 2012. Web. 12 January 2017. ← New Blog Launching Soon! Awesome Blog!! I came across your blog, and there I found valuable information about Benefits of Ozone in Aquariums. It’s beneficial information for us. Thanks for sharing this information. Thank you! We’re happy the post was helpful to you!